We made a trip to Waikiki on the 18th. 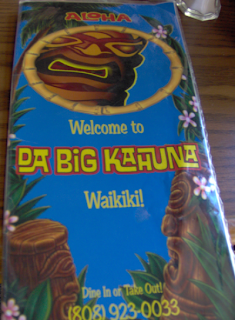 We ate at a super touristy sports bar called Da Big Kahuna, I agreed only in hopes they would have a Big Kahuna Burger from Pulp Fiction fame, also we got a coupon for free fries. The burger was $9 and worth every penny up to $7 after that I was either paying for the name or to eat it in Honolulu. We spent an hour or two in Ala Moana mall at their crazy food court. We've eaten at some pretty awesome food courts in our time, but this place rocked my casbah. We came across this awesome car in the garage, I used to think I'd only see this in RVA, but nope! 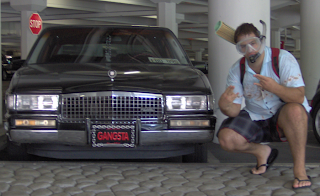 Gangstas live in paradise too. 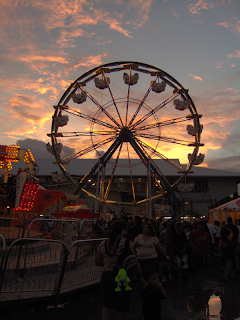 This last picture is from the county fair in Hilo, it was exactly like every other county fair I've ever been to, same people, same rides, same food. I was sick so we didn't stay, but it was a beautiful sunset. Every time I see that picture it just makes me happier and happier. Oh. I mean the one of you, the snorkel mask, and the car. How often do you see this picture?